I’ve been rushing from one thing to the next, trying to workout, trying to keep up at work, and trying to rest. Functioning on four hours of sleep this morning, I’m not terribly clear headed and could go on and on about things being hectic blah blah blah. But that’s not what gave me pause today. I was reminded this morning that sometimes we take – I take – everything much too seriously. I carry a particular badge of honor daily. 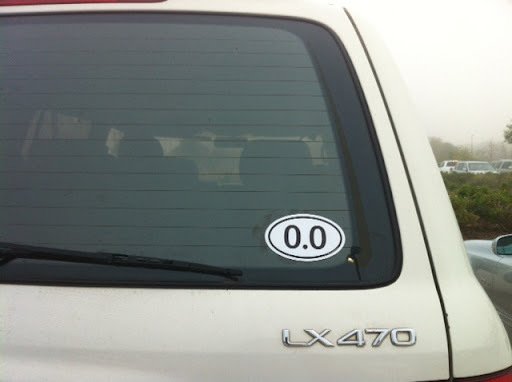 It’s a sticker on the rear window of my car that says 140.6, which is the number of miles traveled during an Ironman. That sticker has lived on my car since June of 2008 when I did my first Ironman, and it’s how friends and family identify my bright blue FJ Cruiser from all the other FJs out on the road. Before that sticker, people would often call me with random questions. “Were you driving down Mopac at 9 this morning?” “Were you at HEB at 9 last night?” “Are you stopped on 290? I see a car like yours two cars ahead of me.” I put the sticker on my car, not to make it more easily identifiable but because I wanted that sticker for months before I earned it. I wanted that sticker desperately. ← Avoiding the post race slump.